Following a string of construction-related deaths last week, city and state officials on Monday said there’s a connection between construction tax fraud and worker fatalities. 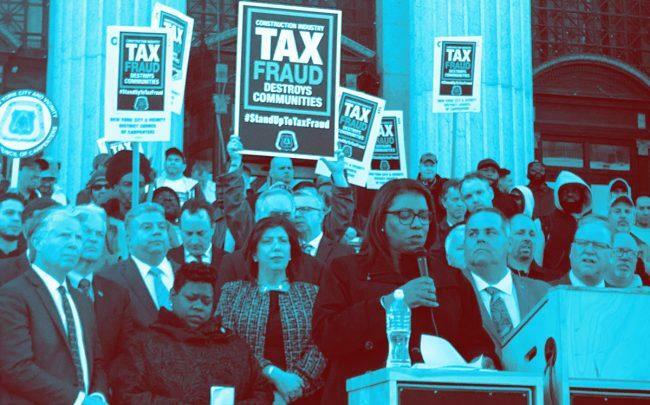 Several elected officials including New York State Attorney General Letitia James and the district attorneys for Manhattan, Brooklyn, the Bronx and Staten Island, spoke at a rally held by the New York City District Council of Carpenters. 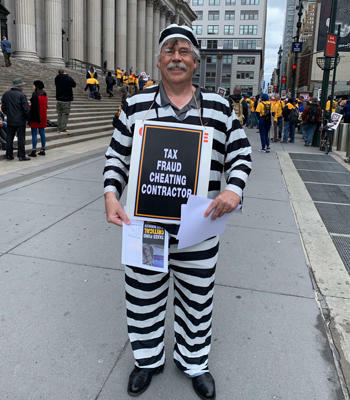 The event, which drew hundreds to the steps of the James A. Farley Post Office in Midtown, was part of a national campaign, Stand Up to Tax Fraud, aimed at construction contractors who pay workers off the books. Speakers at the rally noted that companies that commit wage theft often also don’t have safe worksites. “People who cheat in one area cheat in all areas,” said James Rogers, deputy commissioner for worker protection with the state’s Department of Labor. He called for a moment of silence for a worker who died on Saturday from a crane collapse at 570 Broome Street, which marked the third construction-related fatality in a week. Manhattan District Attorney Cy Vance, who launched a Construction Fraud Task Force back in 2015, noted that Sky Materials — one of two companies charged in relation to the death of a worker in 2015 — was also accused of payroll fraud. 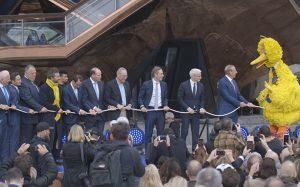 The various officials pledged to make tax fraud a focus. Citing figures from the carpenters union, James said in the city, such fraud totals an estimated $760 million. Hours after the Broome Street fatality, City Council members vowed to accelerate the implementation of Local Law 196, which requires additional hours of safety training for construction workers. In November, the city announced the first phase of the training mandate would be pushed back as a result of “insufficient” resources. The Department of Buildings announced on Monday that it’s sending more than 90 inspectors out to some 5,000 sites to ensure safety compliance.